Oh, summer. With the exception of lovely summer flowers and homemade popsicles, I’m still not a fan of the season. Had it not been for my 4 year old wanting to be out & about swimming, and climbing, and jumping every day, I doubt I would leave my house. Ever. Well, okay, except for leaving the house when in need of new books. Because, books. Which I’ve been whipping through at a blistering speed. As in 3 to 4 books a week. A feat which I haven’t accomplished since I left working in the book industry a good 4 years ago. Apparently the book worm within me is very, very hungry. Anyhow, since summer is officially here, and I’m still attempting to resolve my distaste about it, my little girl & I decided to create a summer popsicle together, with her faaaaavorite summer fruit: the ever so juicy watermelon. A popsicle recipe that she did (nearly) entirely on her own. With her sticky little fingers, and beaming smile, and dancing brown eyes. Seeing this child of mine become so excited about creating new things, always make my heart proud. And sharing recipe adventures with her? Most definitely one of my favorite parts of being a Mommy. So grab your little ones, and your favorite popsicle mold, and get into that kitchen! Particularly with this delightfully quick, and easy (though kinda messy), recipe! Break out that mixture (or food processor), and set out an 8 to 10 cavity popsicle mold, with corresponding popsicle sticks. With a large, serrated knife, cut up the watermelon into 4 large halves. Skin off the watermelon’s rind, before dicing up the 4 cut halves into small cubes. With an melon ball corer, remove those pesky watermelon seeds. Seeds in popsicles aren’t very tasty. Throw those cubes of watermelon, along with the lime juice, and granulated sugar into the food processor, pulsing on high for a few minutes until the entire mixture is fully blended, and smooth. Spoon out the watermelon mixture (I use a small mixing cup as a scoop), into each of the 8 popsicle cavities, filling each cavity all the way to the brim. If your popsicle mold has a lid that has slots for popsicle sticks, slide in each stick before placing the mold into the freezer. If your popsicle mold does not have a slotted lid, add in the popsicle sticks after the popsicles have already been semi-frozen for at least an hour. Freeze until completely frozen solid. I hope you all enjoy the beginning of this summer season! Or if you’re like me, who isn’t very particularly interested in the summer sun, perhaps you will enjoy the fun of creating your own fruity popsicles instead! 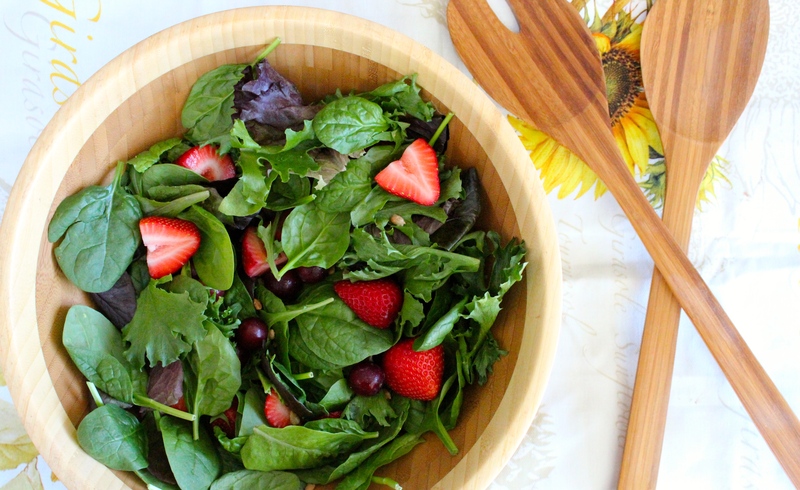 Happiness Project Recipe #61: Strawberry Field Summer Salad! Alright, my friends! When my Mom took my Daughter & I to Wendys after one of my specialist appointments last week, and I tried their new strawberry chicken salad, I fell head over heels for their salad menu! Which, for me, is kinda a big deal. Salads are personal to me. They need to be just right for me to truly enjoy them. Particularly if I want to go back for seconds (or thirds). Call me Goldilocks from the classic fairytale, Goldilocks and the Three Bears, where I need to try everything available first before I decide on what I like most. Snobbish, perhaps? Yes. And I’m not ashamed to admit it. Being a little picky with my sense of taste in regards to creating good food? Makes sense to me. Anyhow, back to this salad! I decided to re-create Wendys strawberry chicken salad, with a couple of tweaks. Wendys salad has onions (which I detest, like you wouldn’t believe) and bits of cubed chicken (which I can only take for so long). Both of which I omitted for my own personal “snobbery.” Which you can very easy add in, if those two additions sound appeasing to you. It’s your salad, right? Right. So with a little bit of tang, a whole lot of sweetness and the perfect blend of crunch, you might fall in love with this salad as much as I have. Since I had 3 large bowls of this last week. Proud of me, sister? 10 ounces of mixed spring lettuce and baby spinach, washed and lightly patted dry. Salads are easy. That’s what I’ve come to love about them. So this one is no exception. Once you’ve washed and sliced (or diced) up the strawberries, set them aside while you wash and pat the two types of lettuce dry. Throw those leafy greens into a large serving bowl. Add in the strawberries, grapes, lovely toasted sunflower seeds and blue cheese. Mix together briefly. And now pour in up to 2 cups of the apple vinaigrette dressing. Toss together the entire mixture, with your salad utensils, or by hand, until everything is nicely mixed and coated. And serve. Just like that. So simple, it’s kinda mind boggling to me. Which is just one of many reasons why I have finally (FINALLY) become a salad lover. About time. What’s your favorite summer salad? I would love to know!